Sydney S. Streeter; photographer: Jack Cardiff; associate photographer: Joan Bridge; camera operators: Ted Scaife, Stan Sayers; process shots: W. Percy Day; color control: Natalie Kalmus; editor: Reginald Mills; sound recordist: Stanley Lambourne; sound rerecordist: Gordon K. McCallum; production designer: Alfred Junge; assistant art director: Arthur Lawson; costume designer: Hein Heckroth; music: Brian Easdale; music performed by: London Symphony Orchestra. Cast: Deborah Kerr ( Sister Clodagh ); Sabu ( The Young general ); David Farrar ( Mr. Dean ); Flora Robson ( Sister Philippa ); Esmond Knight ( The Old general ); Jean Simmons ( Kanchi ); Kathleen Byron ( Sister Ruth ); Jenny Laird ( Blanche , " Sister Honey "); Judith Furse ( Sister Briony ); May Hallatt ( Angu Ayah ); Eddie Whaley, Jr. ( Joseph Anthony ); Shaun Noble ( Con ); Nancy Roberts ( Mother Dorothea ); Ley On ( Phuba ). Durgnat, Raymond, A Mirror for England: British Movies from Austerity to Affluence , London, 1970. Cosandey, Roland, editor, Retrospective: Powell and Pressburger , Locarno, 1982. Gottler, Fritz, and others, Living Cinema: Powell and Pressburger , Munich, 1982. Christie, Ian, Arrows of Desire: The Films of Michael Powell and Emeric Pressburger , London, 1985. Martini, Emanuela, editor, Powell and Pressburger , Bergamo, 1986. Powell, Michael, A Life in Movies: An Autobiography , London, 1986. Kine Weekly (London), 24 April 1947. Variety (New York), 5 May 1947. Christie, Ian, and R. Collins, "Michael Powell: The Expense of Naturalism," in Monogram (London), no. 3, 1972. Walker, Michael, in Framework (Warwick), Winter 1978–79. Lacourbe, R., "Redecouvrir Michael Powell," in Ecran (Paris), 15 February 1979. Andrews, N., and H. Kennedy, "Peerless Powell," in Film Comment (New York), May-June 1979. Thompson, D., "The Films of Michael Powell: A Romantic Sensibility," in American Film (Washington, D.C.), November 1980. Everson, William K., in Films in Review (New York), August-September 1980. McVay, Douglas, in Films and Filming (London), January 1982. Durgnat, Raymond, in Monthly Film Bulletin (London), October 1984. Interview with Powell in City Limits (London), 3 January 1986. Combs, Richard, in Listener (London), 9 January 1986. Sheehan, H., in Film Comment (New York), May-June 1990. Pernod, P., "Les fantomes de soeur Clodagh," Positif (Paris), November 1991. 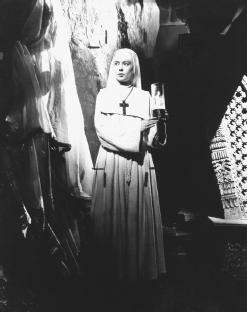 When Powell and Pressburger decided to film an adaptation of Rumer Godden's tale of a failed attempt by Anglican Nuns to establish a convent in the Himalayas, the prospect of shooting in Katmandu filled some of their regular collaborators with great excitement. Such hopes were quickly dashed when it was announced that the entire film would be made in Britain. However, this inspired decision resulted in the creation of one of the most visually imaginative and expressive contributions to a cinema heralded more for its naturalism than such exercises in studio-bound artifice. The palace of Mopu, the former harem turned convent where most of the action takes place, was designed by Alfred Junge and was built at Pinewood. The Himalayan backdrop was painted on sheets of glass and the mountain breeze supplied by a gigantic wind machine. Junge was rewarded with an Oscar, as was Jack Cardiff whose Technicolor cinematography gives the film visual depth and a subtlety rare in colour productions of the time. The studio setting also allowed for total control over atmosphere and mood which, in conjunction with the technical virtuosity, explains why Black Narcissus continues to work its magic on new generations of cineastes. Godden's interest in the confrontation of East and West and the struggle of the nuns who, rather than living in solitude, are forced to confront the world and remain true to their vows is transcended by Powell and Pressburger's concerns with sexuality and, more specifically, the dangers of sexual repression. Indeed Michael Walker perceptively argues that Black Narcissus dramatises a key Freudian syndrome: the return of the repressed. This is the sense of something terrible or uncontrollable returning to haunt the helpless protagonists. Therefore Walker suggests that the failure of the nuns to establish their convent has less to do with the "otherness" of the locale or the people but rather that they "carry within them the seeds of their own defeat." The film is undoubtedly tinged with Orientalist cliché: the local natives are depicted as simple and childlike; Eastern mysticism represented by the mute Holy man who sits under his tree in perpetual meditation; the unbridled exoticism represented by the young general (Sabu) and Kanchi (Jean Simmons). Kanchi like the Holy man never speaks, her silence underlining her cool, seductive "otherness" which contrasts starkly with the increasingly hysterical voices of the sisters. Moreover, the strangeness of the environment, where "the wind never stops blowing and the air is so clear you can see too far," is blamed for the rising unease amongst the Europeans. Yet Black Narcissus also mocks exoticism and otherness, particularly at the moment when Sabu announces that his perfume—the "Black Narcissus" of the title—was purchased at the Army and Navy stores. We must also remember the studio setting which renders the Oriental backdrop as literally a construct, an artificial stage which functions to frame the action and define the characters. The palace is first introduced as a watercolour representation and is last seen disappearing into the mists like Brigadoon. But as the strain begins to tell on the nuns, as repressions return to haunt them, it becomes clear that the chief catalyst, certainly in the case of both Sister Clodagh (Deborah Kerr) and Sister Ruth (Kathleen Byron) is Mr. Dean (David Farrar), the British agent working for the local ruler who has invited the nuns. Like the natives, Dean is also sexualized in terms of appearance with his brightly coloured shirts and bare arms and legs, contrasting with the ascetic off-white habits of the nuns. At one moment of crisis he arrives on the scene stripped to the waist, giving us a wonderfully potent image of raw male sexuality. Dean's initially prickly encounters with Clodagh mask something else altogether. Clodagh's real feelings towards him are first signalled in a brief look of longing which in turn triggers her first memory of her past in Ireland—her love for childhood sweetheart Con whose departure for America led to her becoming a nun. Ruth's desire is more overtly portrayed as pathological. Unseen, she watches Dean and Clodagh, her eyes blazing with a mixture of lust and jealously. Indeed Ruth functions as an embodiment of the danger of Clodagh's sexual repression. While being chastised for paying too much attention to Mr. Dean, she confronts Clodagh with the unspeakable—"you seem quite pleased to see him yourself." This tension leads to the memorable stand-off between the two when a shocked Clodagh encounters a transformed Ruth, her habit exchanged for a crimson dress. She taunts Clodagh by lasciviously applying rouge to her lips while Clodagh sits opposite, clutching a bible. But Dean is no more able to fully accept his own feelings for Clodagh. He is consistently rude to her and when taunted by the spurned Ruth about his love for Clodagh he flies into an uncontrolled rage screaming, "I don't love anybody." Ruth's failure to seduce Dean leaves her with only one choice of action left—the destruction of her rival—and so the film builds to its devastating climax. In the golden light of dawn Ruth stalks Clodagh to the chapel before erupting out of the Palace doors like an apparition from hell and attempting to push Clodagh over the precipice as she rings the morning bell. In the struggle it is Ruth who falls to her death. This sequence was an early experiment by Powell in what he termed "composed film," scored first by Brian Easdale then shot according to the rhythms of the soundtrack. The departure of the nuns underlines the ultimate victory of repression. Clodagh and Dean exchange pleasantries, she offers him her hand which he holds momentarily. Then the rains break, interpreted by at least one critic as a symbol of sexual release, but we are left with an image of Dean, fated to remain with the "ghosts" which Clodagh is able to leave behind. The release of Black Narcissus in 1947 coincided with the end of the Raj. The retreat of the nuns not only echoes the British withdrawal from India. It is the image of Dean, the English colonialist suffering the burden of his own repressed emotions, which provides an unintentional reflection on the undoing of imperial power.